So you’ve created an awesome, HTML responsive newsletter for your employees and now that it’s time to send it, you’re panicking. Is it possible to send an employee newsletter in Outlook? Wouldn’t it be great to know how to send mass email from Outlook using responsive HTML email templates that look exactly how you envisioned them? At ContactMonkey we understand that your employee newsletter plays an incredibly important role in your internal communication strategy. Internal newsletters are a great opportunity to captivate the attention of your employees, since, when done properly, they can boost morale, and increase employee engagement. 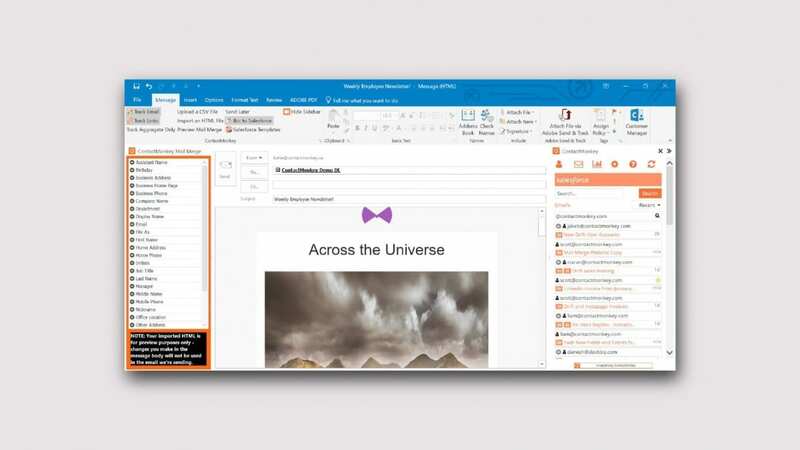 Just as well, we also know that sending mass emails or an employee newsletter in Outlook has been, historically, a surprisingly difficult task. Although one of the most widely used email client in the world, with Outlook there’s always the fear that your emails won’t render properly or that they will lack mobile responsiveness. It’s even worse for those internal communicators with an eye for design, given that most of your images won’t show in Outlook and more often than not, your margins and padding are not what you envisioned. This painful experience is so universal, that there’s thousands of articles describing how it’s impossible to send responsive emails from Outlook. Take for example this one by MailStyler, showcasing the frustration of sending newsletters in Outlook just to watch them collapse after being sent. “Unfortunately, the number of people who will choose Microsoft Outlook to send a newsletter is still pretty high. It will be frustrating, for no template builder, not even MailStyler, can make sure that the layouts you create and send stay responsive, and it’s Outlook’s fault,” they said. Well, we’ve put a stop to that. There is a way. Here’s how. With ContactMonkey’s new Outlook mail merge in Office 365 tool, you can now upload responsive HTML emails from Outlook, personalize them, and send them with the certainty that your emails will look exactly how you want them to in all email providers, including Outlook! Yep. It’s a pretty big deal. I’ll give you a couple of seconds to stop clapping. Okay, now that your cubicle standing ovation is over (what we call a “CSO” in the business), let’s go over 4 easy steps to send an employee newsletter in Outlook. You can now stop asking yourself, Is this template too complicated? Will it look all funny in Outlook? Because ContactMonkey’s Outlook Mail Merge in Office 365 ensures successful delivery and perfect rendering. Click on “Mail Merge” and then on “Mail Merge with Office 365” to get started. An Outlook message window with our Mail Merge tool will pop up. You’ll see in the Body of your message a preview of your HTML email. Don’t worry if the HTML looks a bit off in the preview on your screen. We won’t let Outlook adjust your original HTML upon sending. PS. Don’t make any changes to the HTML after inserting. If you need to make edits, make those changes in the original HTML file, and upload again. If you don’t already have a responsive HTML newsletter template, not to worry, you can create one from scratch or use our pre-built templates within our drag and drop email template builder and send straight from Outlook to your Outlook distribution lists! Since ContactMonkey integrates within Outlook, all of your Outlook functionality remains the same, including selecting a distribution list for sending your HTML email template from Outlook. We’ve also made importing a CSV a one-click task. To select a distribution list: click “To”, select your distribution list from the drop down and press “OK”. You can also upload a CSV by clicking on “Upload a CSV File” on your ContactMonkey ribbon. Personalization helps drive email engagement so we recommend adding a personal touch to your subject line. On the ContactMonkey Mail Merge Picker (on the left) click and drag any merge field you would like to use into your subject line. Probably “First Name”. To personalize the body, make sure you add the respective merge fields in your HTML file before uploading. You can preview by clicking on “Preview Mail Merge”. A window will pop up showing you whether you’ve inserted your merge fields correctly. Green means everything is working properly, red means some information is missing. After hitting preview you will also be sent a preview of your HTML email from Outlook so you can make sure that everything looks right. After that you can hit send and voila! You’ve now sent a fully responsive HTML employee newsletter from Outlook in 4 easy steps! As mentioned above, sending better employee newsletters in Outlook painlessly is just the beginning. What makes people open an internal email? Included with the ability to send responsive emails to your employees, you can use Outlook email tracking for internal communicators to track the message and gather employee feedback in real-time. We will show you overall campaign performance, or performance at an individual employee level including open rates, link clicks, location, devices, pulse survey results and more. Gathering employee feedback is an essential part of an internal communicators role. Unfortunately, more often than not this consists of a 60 question survey that is sent once or twice a year! Using our pulse survey tool you can add a simple employee engagament survey questions to your emails and have employees directly give you feedback from within that email. No extra steps, no extra tools. It literally takes less than 3 seconds! Since you’re also able to track opens, link clicks at a personal and aggregate level using our dashboard, you’ll be gaining the insights needed to keep optimizing your internal emails every time you hit send. So … what are you waiting for? Start sending responsive HTML emails from Outlook now. Your employees and your boss will love you for it.